We've been looking for this for a long time! 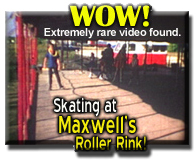 Check out this 8mm home film clip from Maxwell's Roller Rink. They would set up a tent, crank up the organ music and the "Lisle kids" were ready to party! This footage was shot (looking north) when Maxwell's tent was set up in the field behind the old VFW hall. Rt. 53 is just to the left. This film was shot during someone's "Hawaiian" birthday party. Awesome Village of Lisle history! This area is now Honda of Lisle.